A team led by Perkins Eastman, a New York-based architecture firm, was selected this week to redesign Harvey Milk Plaza in San Francisco. The firm beat out 33 other hopefuls in a competition to make over the Castro neighborhood space. The Perkins Eastman-led design includes a metaphorical soapbox and community space as well as a slanted amphitheater over the Castro Muni station entrance. The amphitheater will include benches where people can sit and look out over the neighborhood. There also will be a timeline of Harvey Milk’s life and work. The plaza will be lit up with a field of LED candles, a tribute to the candlelight vigils that have taken place at the site over the years. Donors will be able to purchase individual candles and proceeds will go toward the project. 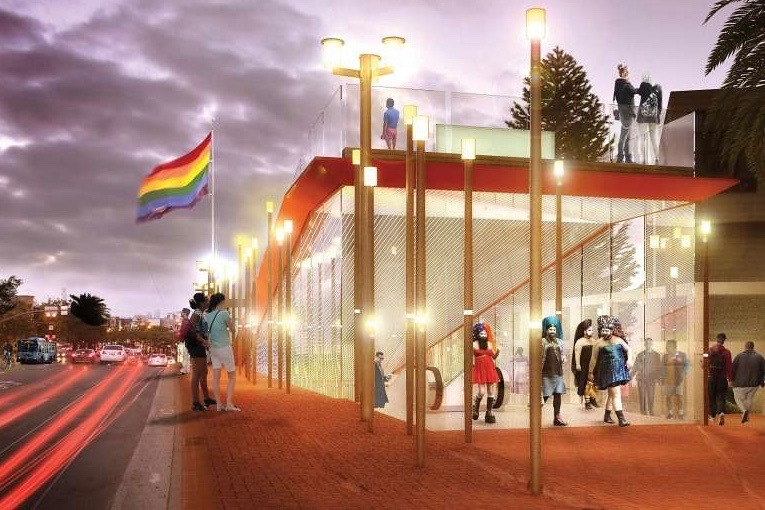 “What set the submission from Perkins Eastman apart was their bold, immersive idea; passion for Harvey’s message; and willingness to iterate the design based on feedback during the competition process,” Andrea Aiello, president of Friends of Harvey Milk Plaza, said in a statement. An anonymous donor donated $500,000 for the design competition and initial project funds while the Friends of Harvey Milk Plaza group is looking to raise $10 million more for construction and maintenance, per Hoodline.